In our first Wednesday Column by guest writers and campaigners, former OWC columnist, Andrew Boswell looks at the shocking cuts to local children's services. Trevor Philip’s has written about the St Valentine’s Day massacre when Norfolk’s ruling Conservative Cabinet pushed its budget through Council on February 14th. The February 14th budget meeting was the worst day in my near six years as a local authority councillor. Whilst campaigning, marches and protests, before Christmas and in the New Year may have saved some of the worst cuts in Adult Social Services, there are still many bad cuts for Adults and the disabled. However, on February 14th, it was children and families who came off worse, Children’s Services has done ‘even worse' by comparison. At the February 14th budget meeting all the opposition groups tried to save the cuts to Youth Services and to early intervention work for children: amongst £60m cuts for 2011/12, vital, early intervention, services for our most vulnerable children are being cut or ‘reshaped’ out of recognition. Two proposals in the budget were not in the Council’s Big Conversation, the public consultation on the cuts, and were introduced very late on. These were the closure of the Unthank Centre and the complete loss of the Family Group Conferencing Service (FGC). Both provide vital services to our most vulnerable, deeply troubled children in Norfolk, children who have been abused, abandoned and neglected. They save money by working with children, parents and carers to keep families together, and prevent children coming into care. The FGC Service assists children to return to the care of their families, thereby reducing the stress on the foster care service. Last year it saved £1.4 million and this year it will save up to £2 million. Why are the Cabinet closing such a vital service that saves this Council money? I was shocked that this service was just completely cut when it wasn’t mentioned in the Council’s Big Conversation. A further issue is that Family Court judges may direct the authority to hold a Family Group conference, or similar process, for a child. The Council have not made it clear how they will deal with this situation in the future after the cutting the service that can deliver this, but it will cost more money now the service providing it is being cut. The Unthank Centre saves costs in the longer term: it will be a less effective, unrecognisable service after the changes proposed for it. Last week, I went to the public meeting on the Unthank Centre. There were many experts there – mental health social workers, care workers, child protection professionals, foster carers, teachers and school governors. All these people are saying closing the Centre will destroy a very good service that has an excellent reputation, but their advice is being ignored by the County Council. These 3 pieces of art work were created by children aged between 7 and 12 years old who attend the Unthank Family Centre. The children attended a workshop supported by centre staff and local artist Alexis Evans. 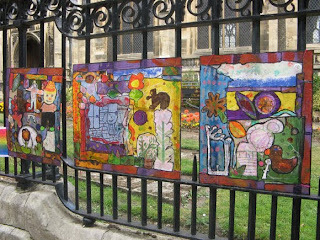 The art work was exhibited on the railings of St.Peter Mancroft Church in the centre of Norwich on Sunday 13th September 2009. The proposals to replace the Unthank Centre with mobile practitioners around the County won’t work. If you remove the special space provided by the Centre, then you have ruined the service. 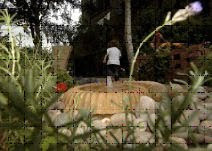 That secure, reliable place is so helpful to give security to families dealing with very difficult issues. Get rid of it and this special service that has helped so many Norfolk children will be gone for ever. Further, the management posts are needed allow the family social workers to operate safely and in a focussed way. It is well known that if there are not managers to provide leadership and direction, to manage referrals consistently and to provide supervision, then the family therapy work will suffer and be less effective. This amounts to a significant qualitative impact to this frontline service. Therapists working with very difficult situation are likely to suffer more ‘burn out’ too without the expert supervision provided by the Centre. What the Council propose instead is a poor imitation of the Unthank Centre and a significant qualitative impact to this frontline service. David Cameron’s reassurances that Coalition cuts would not damage frontline services ring hollow in Norfolk after this. The Allen Review (2011), Munro review (2011) on Child Protection, and Frank Field's Poverty Review (2011) all emphasise the importance of early intervention too. When cutting these services, the Council not only causes hardship, but also looses money. We can only assume they are part of the ideological attack on public services that underlies what the Tories are doing rather than what they say. The Unthank Centre was scrapped despite a petition with 2300 signatures being handed to the County Council Cabinet collected in a very short time since the cut was not in the Big Conversation. I think these cuts are incomprehensible as they defy logic, when, with Care costs soaring, they should save the Council balance sheet over £1m next year if kept. Green Party councillors tried repeatably at the February 14th council meeting to save these services. We proposed an immediate, cross party, review be carried out on child protection and wellbeing before implementing these changes, but the ruling Conservative administration turned it down. These vital services can still be saved without further cost to the council as one of them saves enough to fund both of them for subsequent years. We urge concerned members of the public to write to the Council to call for this review to happen urgently – I hope that Norfolk will prove to be a ‘listening council’ that its leader, Councillor Derrick Murphy, claimed it to be on February 14th. Norfolk County Council met today, Monday 14 February, and adopted a Conservative inspired budget which slashed £60 millions of local services. This was its initial response to a £155 million funding reduction from the Con-Dem government. On Valentine’s Day, mostly renowned for romantic love and swollen hearts - but also for the notorious gangster killings in Chicago - ruling Tory councillors chose to rip the heart out of Norfolk. A thousand service jobs will go and many others in the private sector will follow as a consequence. The axe fell heavily on children, young people and the disabled. Services designed to keep children in a safe family environment will now be cut or reduced, increasing the risk that children will be taken into care. Foster and adoption services will be cut, even though keeping children in institutions is the least preferable and most expensive option. Sensory support services for deaf and blind people will be cut by nearly £½ million. Another £½ million will go from services which support those with mental health difficulties to live independently. And if that wasn’t enough to turn a blue rinse pink, in a move which will cast eternal shame on its proponents, confidential expert advice services for young people are being ended in perhaps the most severe attacks on youth services anywhere in England. It will, of course, create future problems and greater funding needs as well as devastate lives. This was another Valentine’s Day Massacre and the gangsters wore blue suits. And it was a massacre of the innocents. It is not ‘bloated local government bureaucracy’ under attack, but the very essence of what makes a society civilised: the real ‘Big Society’ of mutual support without an opt-out clause which requires all who can to contribute to the protection of the vulnerable - and to the promotion of what is valuable. UK local government services and the welfare state cannot depend on the often not-forthcoming charity of under-taxed ‘philanthropists’. Publicly funded services were created because of the inadequacy of Victorian charity. What we are witnessing is an attempt to return to dependency on the overstretched generosity of the most caring - who already contribute more than their share to family, community and civic life. The funding of support services via taxation - national and local - is being destroyed under the guise of strengthening society. Given its council’s enthusiasm for this, Norfolk may have to change its boundary signs from ‘Nelson’s County’ to ‘The Heartless County’. Some local wags are already calling this destructive process – and perhaps its outcome – as ‘Norfolking services’. This year is just the beginning. The council’s ‘Big Conversation’ consultation was a Big Con. It fell on deaf ears and next year’s county budget will see the Tory axe return for many services which mobilised public support this time round. But such cuts are not taking place without resistance. If Norfolk’s Valentine’s Day Massacre lacked romance it did not lack tragedy and drama. Several hundred dedicated staff and service users, alongside ‘Norfolk Coalition Against the Cuts greeted axe-wielding Tory councillors with bloodstained banners and placards listing the victims of the slaughter: ‘youth services’, ’support for the disabled ‘. Several people disrupted the council budget meeting and were ejected. Three were temporarily arrested then ‘de-arrested’. The campaign will continue to grow. Throughout Eastern England, campaigns against the cuts are emerging with the Spring flowers. The Suffolk Coalition for Public Services hosted a meeting in Ipswich on 12 February, Cambridge Against the Cuts had a demonstration on February 12th and has a lobby on the 15th. A similar group in Southend meets on the 16th, with a platform shared by unions and students. Milton Keynes will see a meeting on the 18th, Harlow one on the 24th. A hundred Suffolk firefighters, their families, and supporters, marched through Ipswich on Saturday 12 February to protest against proposed cuts to Suffolk Fire Service. And a national ‘March For The Alternatives’ is being organised by the TUC in London on Saturday 26 March, bring together hundreds of thousands of concerned citizens to demand alternative government policies. Dozens of coaches are already being booked by unions and local anti-cuts coalitions to take people from East Anglia. There are alternatives to Con-Dem slash and burn, of course. The £81 billion budget deficit the government chooses to pay off in a few years is neither unprecedented - one of many such myths - or unfundable by more civilised means. More than £100 billion a year is lost to the UK revenue from corporate tax evasion and tax avoidance: Vodaphone dodged up to £ 6 billion UK taxes by moving income to a Luxembourg subsidiary; Boots saw its UK annual tax payments drop from £131 million to £20 million upon moving its HQ to Switzerland; Cadbury’s - now based in Switzerland - will similarly avoid £ millions of UK revenues which could have funded the services of Norfolk County Council or others. Topshop, part of the Arcadia group run by Sir Philip Green, the Con-Dem government’s ‘efficiency adviser’, paid a record £1250 million dividend to its owner (Sir Philip’s wife, Tina Green) in 2005. She lives in Monaco so she avoided paying UK income tax of around £285 million – enough to pay the salaries of 20,000 UK nurses. And of course there are the banks. Despite government rhetoric, massive bonuses continue. This recently forced the resignation of Lib Dem Treasury Spokesperson Lord Oakshot. HSBC transfers profits to the UK via Dutch subsidiaries avoiding as much as £2000 million in UK taxes. Norfolk’s budget is small beer compared to this. And yet the Tory councillors of Norfolk have not screamed for tax justice instead of service slashing. And Norfolk’s MPs , all Tory or Lib-Dem, have not rallied to the defence of the county’s public services or demanded government action to raise revenues from rich tax dodgers instead of attacking the young, the deaf or the mentally ill. This will not be forgotten and may well affect the outcome of the May 2011 local elections and local results in the next General Election. The Silence of the Lambs (North Norfolk’s Lib-Dem MP, Norman Lamb MP, that is) and his Westminster pals - Tory whip Chloe Smith and others - will be remembered by the young, the disabled, the unemployed and their families across Norfolk when it comes to the vote. And in Norfolk on every 14 February from now on, families will remember the 2011 massacre of services which could have been avoided if Con-Dem politicians had put ideology and opportunism aside and, well, simply had a heart. At last, after 18 days of mass protest by ordinary Egyptians across the country - notably in Tahrir (Liberation) Square in the capital, Cairo - President Hosni Mubarak has resigned. After several attempts to cling onto power, he was forced by the overwhelming commitment of the Egyptian people to demands for real political change and the end of his regime, to go. Efforts by his Vice President and sections of the army high command to persuade the people to accept an increase in salaries and wages and largely cosmetic political reforms proved to be in vain. Now the Supreme Council of the Armed Forces is in control and has supported the meeting of a Constitutional Council, including judges and other supposedly impartial figures to develop a framework for moves towards a new Constitution and political dispensation. While the future of Egyptian politics remains unclear, there is good reason to believe that the democracy movement has achieved a significant objective – the overthrow of a 30-year old authoritarian regime inherited from President Sadat and the beginnings of a new, more open politics. The army has agreed to lift the state of emergency that has been in place for decades, as soon as the situation quietens down and there is every sign that they will respect whatever arrangements the Constitutional Council devises for an orderly transition to a more democratic system. The international community has, also at last, accepted the inevitable and broadly welcomed the prospect of a more democratic Egypt, although there are real concerns as to the medium term effect on Egypt’s policy towards Israel, with whom President Sadat made peace, much to the anger at the time of the Arab league and the Arab World as a whole. 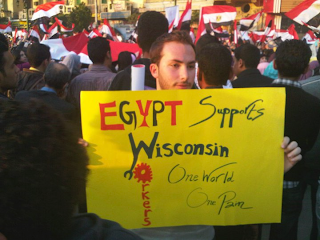 The Israeli authorities in the meanwhile remain anxious about the prospects of an Egypt that may become a slightly less acquiescent partner in US Middle Eastern policy – although it seems unlikely that there will be any radical change in Egyptian foreign policy in the immediate future. Elsewhere in the Arab world, where events in Egypt have been closely followed through all of the media now available (radio, TV, blogs, twitter and social networks), there are indications of a similar desire on the part of ordinary people for greater freedom and democracy. In Tunisia, for example, where mass demonstrations earlier in January led to the overthrow of the long-standing authoritarian regime of strong-man President Zeine ben Ali (who fled to Saudi Arabia) , there is continuing support for major political reforms and greater freedoms. There too, the democracy movement is alive and well, and apparently making significant advances, for the moment at least. In Jordan, King Abdullah moved swiftly in the face of popular protest in the streets of Amman to dismiss the prime minister and replace him and his government, and to promise ‘significant reforms’, largely as a measure to pre-empt pressure for more radical change. In Syria, President Bashar al-Assad signaled, after the mass protests began in Tunisia and Egypt that ‘he understood the need for change’, but calls or demonstrations against the regime – a ‘day of rage’ - last weekend (5-6th February) – were insufficient to generate the large scale popular protest that was manifest elsewhere. It seems unlikely that there will be significant reforms in Syria in the near future, but the impact of the Arab democracy movement is hard to predict. In Yemen, street protestors in the capital, Sana’a, and other cities were able to wring some important concessions from President Ali Abdullah Saleh – notably, that he would not stand again for the presidency after the end of his present term and that his son would not succeed him, as well as some economic reforms. So far, however, they have been unable to topple the 68-year old President, who is also supreme commander of the armed forces of Yemen, and on Friday he chaired an expanded meeting of the National Defence Council, political leaders and the Security Committee, to discuss the modernisation of the armed forces and security as well as improvements in the salaries and financial allowances of government staff and the armed and security forces. They also reviewed ways to reduce expenditures and raise incomes and revenues. This looks like an attempt to strengthen the forces of repression rather than to meet the demands of the demonstrators, but again, the future of the democracy movement here too is difficult to predict. Finally, in Algeria, where demonstrations in the early part of January in response to increases in the price of basic goods resulted in government moves to moderate the price increases and make changes to certain aspects of economic policy, there were plans for large demonstrations this weekend (12-13th February) – following the success of such demonstrations in Egypt - in opposition to the continuing control of Algerian politics by the FLN and the army – but so far (as I write this column on Saturday morning) they have met with heavy repression and have been effective kept under strict control. It may not prove so easy, however, to contain the Algerian people after decades of repression and a 10-year long and brutal struggle against the Islamists in which thousands of Algerian civilians (and security personnel) lost their lives. The Nuclear Industry’s Desperate Last Stand ? As I write, Sizewell B nuclear power station on the Suffolk coast is shut down. The news that a problem at Sizewell B, causing it to shut down again after its lengthy and expensive closure last year, must add to French parent company Électricité de France’s (EDF) woes. You could be forgiven for thinking that the on-going trouble at their Finnish and Flamanville reactor sites, and the failure to secure big international contracts, were dampening France’s ardour for a nuclear future. But you would be wrong. The French Government is furiously lobbying the European Council to replace Europe’s goal of 20% “renewable” energy by 2020 with “carbon- free” electricity instead. Sounds good, doesn’t it? After all, anything that is carbon-free must be a good thing, mustn’t it? Not so! In nuclear speak, “carbon-free electricity” means nuclear electricity. The revised national policy statements for energy - at present being squeezed through the UK parliament without much publicity - make no bones about wanting all our electricity to be nuclear-generated by 2050. Our Government justifies this by pretending that it will be “carbon-free”. And France is trying to persuade the European Union to ensure that all Europe’s electricity becomes nuclear too. The picture of a gently humming nuclear reactor, effortlessly magicking electricity out of busy little atoms at no carbon cost, conveniently forgets the decades-long carbon haemorrhage that led up to that. Uranium mining, transporting, processing and enriching, plus the ten-year long station-building and pylon-erecting from remote sites, and the colossal carbon-belching nuclear office bureaucracy itself and the immense ministerial departments bulging with civil servants, not to mention the carbon that will continually be emitted in coping with the nuclear waste for thousands of years. This is what they call “carbon free”. That is only one aspect of the lie. The fact is that benign renewable energy (which nuclear is not) is at present experiencing unprecedented growth in Europe, representing nearly 40% of new electricity generation in 2010. Meanwhile nuclear is declining precipitously; since 2004 18 nuclear reactors closed, only one became operational. Is nuclear energy worth resuscitating – with the £billions that would entail? We know that nuclear only works if it is propped up by huge subsidies (however heavily disguised). So if the EU is tricked by this lie into scrabbling around to prop up nuclear with even more money, that will assuredly come from what is presently funding the many-pronged, resourceful and diverse benign renewables. Because the carefully orchestrated anti-wind pack bays so loudly, we tend to forget that the renewables are not only for electricity; but also for transport, heating, air conditioning, agriculture etc. If the momentum being put into all those is spirited away, solely in order to produce nuclear electricity across Europe, what a colossal mistake our generation will have made – and what a mess we will have made for succeeding generations to grapple with! 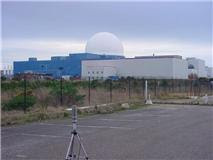 As the French-owned Sizewell B idles on the Suffolk coast, perhaps the current down-time there could be usefully spent in checking whether there are man-made uranium emissions, accumulated over the years in the soil around the site. At Hinkley Point in Somerset, where EDF wants to build another new nuclear station (Sizewell C), an independent report by Green Audit (GA) has shown that EDF’s own data, used by EDF to claim that the site is safe from harmful deposits, are incorrect. Professor Chris Busby of GA has re-analysed EDF’s data to show that there may be 10 tonnes of enriched uranium splattered across the site, which could only have come from the neighbouring reactors, over the decades for which we have been assured they were all so safe. Raised incidences of childhood cancers downwind of Hinkley Point have long been known to GA, though hotly denied by the establishment. Uranium is not simple to check up on. If the establishment got it wrong in Somerset, they may have it wrong in Suffolk. “The Sizewell B nuclear plant has been built on the Suffolk Coast, a site that has been earmarked for the construction of several more nuclear plants. However, Sizewell will certainly be affected by rising sea levels. Engineers say that they can build concrete walls that will keep out the water throughout the working lives of the new plants. But that is not enough. Nuclear plants may operate for 50 years, but it could take hundreds of years to decommission them. By that time, who knows what sea-level rises and what kinds of inundations the country will be experiencing”.